Mopar employees arrived at a local donation and distribution center for the needy in Southeastern Michigan with trucks filled with baby items and a donation check. A local United Way referral organization in Southeastern Michigan got a surprise visit from Mopar employees who'd been collecting donation items and money from Chrysler Group employees. The entourage included trucks filled with baby needs items and a grant check. Hundreds of baby supply items such as diapers, clothing, books, toys, strollers, bottles and more. Mopar employees brought them in trucks and trailers provided by Chrysler as well as a $7,500 grant check to assist Southeastern Michigan Indians Inc (SEMII) with the purchase of more items for the infants in need drive. 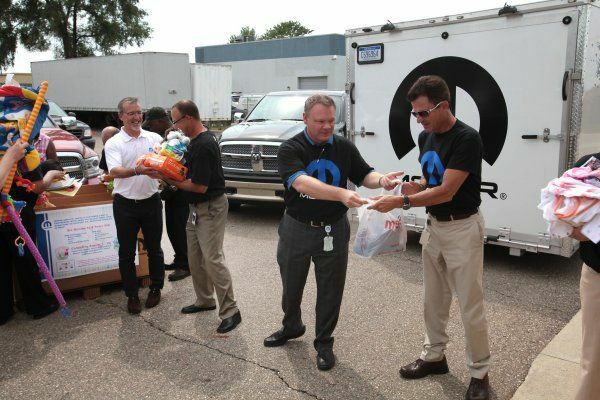 Mopar is part of the overall Chrysler Group's company-wide efforts to help the United Way in the communities within which Chrysler employees live and work. SEMII's headquarters office is only two blocks away from Mopar's main distribution facility in Center Line, Michigan, where the majority of Mopar's employees work day-to-day. Last year, Mopar employees banded together to repaint the SEMII facility and sponsored a clothing drive to obtain professional attire for those in need and looking for work.